I am a Steve Madden girl through and through! I'll definitely go with the Steve Madden pair! These boots look almost identical and I can never pass up a good Steve Madden shoe. They're always amazing! I'll take the Steve Madden ones any day!!! Undoubtedly Steve Madden. I adore Steve Madden. I can't wait until they're on sale. I like the Steve Madden heel better. P.S. Thanks always for your wonderful comments on my photos - always makes me happy! Oh, you KNOW how I love anything Steve Madden! What a lovely match, my dear! that's a really great deal ! Gotta say, go Steve Madden! They look similar and styling! I love me some Steve Madden. So stylish and VERY well made! Nice! But I don't think they would fit my calves. LOL! Steve Madden has the best shoes! I cannot tell you how many Steve Madden shoes I have- and those boots are HOT!!!!! I want them. So perfect, both! Steve Madden. I like his shoes anyway and they're so similar that the splurge wouldn't be worth it to me. I'm so glad there is a cheaper version. My Michael Kors are brown but nearly idential- i paid $198, in the middle of these 2! Love them! They are both beautiful, but I would go for the Steve Maddens with that price! i love the Steve Maddens...always had a soft spot for his shoes. I think I would save up for those Weitzmans. The leather looks so supple! Even better! I love Steve Maddens, so I think they're a steal compared to the Stuart Weitzmans. I know some people hate on Steve Madden, but his shoes are awesome! OMG I bought those Stuart Weitzman ones last yr and I do love the stretch calf... But Those Steve Maddens look pretty darn good especially for the price!! Even if the leather is a little different in quality, the truth is that the difference in price makes it no worth it. I like steve Madden. That is perfect and undoubtedly more fashionable. Steve Madden! I really like his shoes, for price and quality, they're not too shabby and I see no reason to turn them down now. Great find again Erika! You can never go wrong with long black boots! I love the Steve Madden ones. I adore those boots ! Definitely Steve Madden. Steve Madden is one of my favourite shoe brands anyway. I love Steve Madden shoes, so this is an excellent alternative! You're on fire with your fab shoe finds, Erika! Very chic - they look like the perfect OTK boots! In this case I'd probably pick the cheaper one - the SM's look identical to the SW ones! they both look similar but will need to try on to determine for myself. Oh absolutely the Steve Maddens!! I am a diehard Madden fan and these are sooo similar! 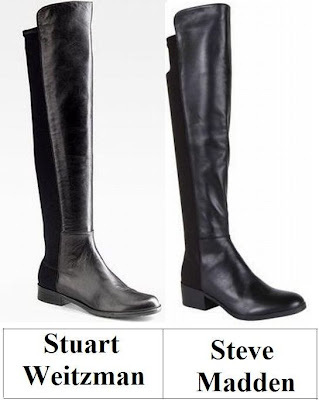 I like the Stuart Weitzman boots. Wow, very similar. I don't like this style, so neither. The similiarity is amazing! Definitely the Maddens! I've been looking for something like this for my every day casual looks! thanks for sharing this, def going for the steve madden pair!